On October 23, 1940, Edison Arantes do Nacimiento was born in Tres Coracones, Brazil. Though he eventually became the most famous soccer player in the world, he came from a very poor family. When Edison was 15, he joined the Santos FC Junior team and began his first professional role as a striker. A striker is an important half-field offensive position. After only one season, Pele, a nickname Edison’s teammates gave him, played well enough to join the senior team. He went on to play for the Santos eight years. At sixteen, Pele was already the top scorer in his league. The following year at only 17, his team entered and won the World Cup competition with Pele as the key player. In this tournament, Pele scored a goal that helped Brazil win. He also made history as the World Cup's youngest player. Pele went on to help Brazil win two more World Cups, in which he scored his 100th goal in 1970 against Italy. In 1972, Pele retired from Brazilian soccer. He came out of retirement three years later, however, to play again for the New York Cosmos. Although he passed his best years, he was such a well-known player that his reputation helped make soccer more popular in the United States. 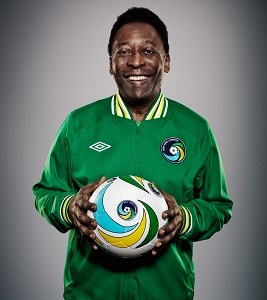 After Pele retired for good, he became the game's ambassador. Traveling all over the world, he met people and promoted the work of the United Nations (UN) and UNICEF, an international children's fund. Today, Pele is rightly called the ‘king of soccer’ because of his record-setting goals and his life-long dedication to the game. His legacy continues to inspire fans all over the world.